On May 8, 2014, the Tools exhibit took place at the Big Car Service Center. This piece is by Bill Foley. How the photographic image was created and the commonly used tools remained unchanged for nearly 100 years- roll and sheet Film, processed in wet darkrooms and then printed, by hand and machines. With the introduction of digital, this all changed. Starting in the mid 1970’s, I started as an analog /film photographer and went kicking and screaming into the digital age. Despite having been successful in the transition from the early 2000’s to the digital methods, I remain somewhat of a Luddite in that I still shoot and process my own film. The tool I propose is a Leica 1C enlarger. 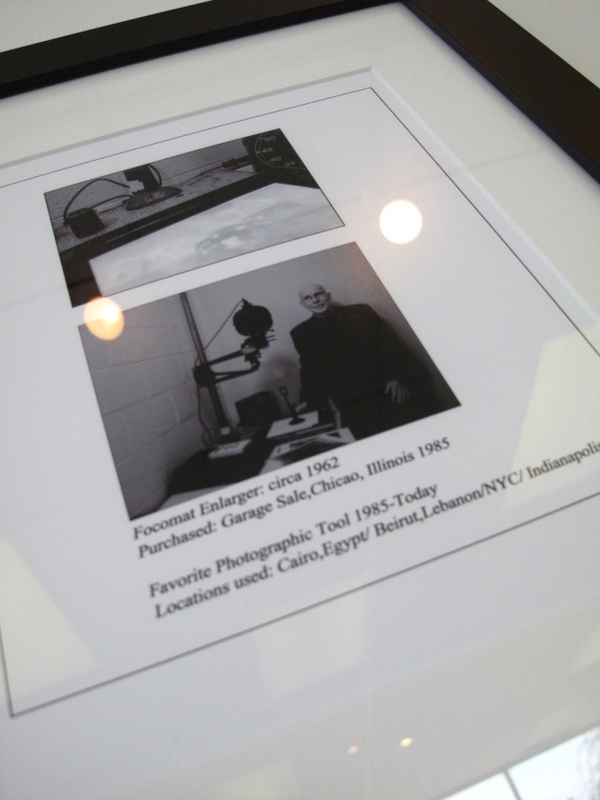 I purchased this enlarger in December of 1981 on a trip to Chicago, I was on a 2 week break from Cairo, Egypt. I packed the enlarger up, and used it in Cairo until I moved to Beirut in 1982, enlarger in tow. The enlarger moved to NYC with me in 1985 and from 1985-2005 I printed work I shot for clients, the prints for a number of books – “The Carmel Hill Project 1995-2000” 2 books and the 50 exhibition prints for a show of this work at the Museum of the City of NY. When I moved from my loft in Tarrytown, NY, in 2003, I realized I would not have a darkroom and so, I donated it to the “Sleepy Hollow” high school photography program. Yes, I would and it moved with me to bucolic Indianapolis, where since 2007 it has been in the Marian University darkroom where I continue to print with it. Today I’m printing work from the 1970’s to today in preparation for a retrospective in 2015.